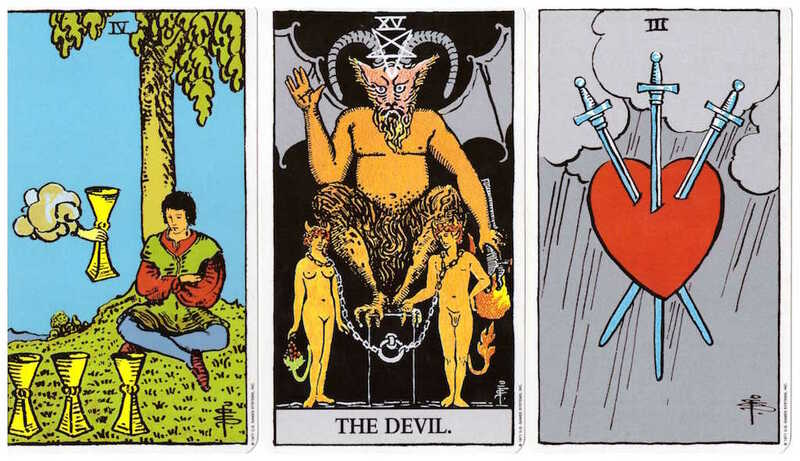 4 of Cups, The Devil, and 3 of Swords from the Rider-Waite tarot deck. This month’s New Moon Reading offers us a glimpse into our hidden attachments and illusions that have gone unchecked within our psyche. The focus here is about our heart and all the history and pain locked up inside it. We have either to let it dominate us, or to acknowledge its powerlessness and empty clutches by truly opening our eyes to something. When we feel stuck in life, it is often because we have unresolved emotional baggage weighing us down. Stuck in a repeating cycle of wondering what went wrong, who is to blame, and how we could have done better “had we known”. We are literally lost in a perpetual loop of unproductive self-talk that doesn’t allow any new experience to enter and any new insight to emerge. The image of the 4 of Cups, with the man’s crossed arms and closed eyes, states clearly that we are blocked and closed off. We have no awareness of the new and fresh cup that appears to us with all its inherent solutions and blessings. When we close ourselves off to what is easily and readily offered, we only go deeper into a darker space that holds even fewer answers. Such is the space of The Devil. We are bound and limited to an understanding, which has been exceptionally and skilfully exaggerated. This huge figure stands rather unsteadily on a small box. This meaning is directly implying that disinformation and deceit are disproportionate to what is actually occurring in our lives. The chains that are keeping the two “bound” individuals can also be easily removed. The question here is, “what will it take” to cast off the chains and wake up from this apparently oppressive force. The answer is so obvious, it is almost comical. Yet, we cannot pull ourselves away from our bind for one – and only one reason: we are attached to our idea of what resolution should look like. If the 4 of Cups portrays an external presentation, then The Devil would be its equivalent internal landscape. Both are locked in, stuck and stagnant representations of energy that needs to be freed and released. The whole key to The Devil here is to understand the illusion. It requires a very honest look at what is confining our awareness about something. We seem bent on proving otherwise, that we are on some crusade of justice and self-assertion, bravely walking a path that we think is about empowerment. When in fact, what is most likely occurring is our mind being convinced that the material we are working with is still relevant. This doesn’t mean that our previous experiences are false or that our emotional reactions to them are meaningless. The Devil card is indicating that that material needs to be scrutinized and analyzed to ensure we are not servants of it but rather mindful of how it serves – or does not – serve us. This card can represent an external person or viewpoint, or our internal voice set in a particular pattern. This is having a powerful influence on how we are formulating a self-image. Very often, being lured into thinking one is a victim can distort what is actually occurring, and so distort the reaction one feels is necessary to address it. Addressing it from this false premise locks us into a relationship with this material and, what’s more, creates further opportunities to keep the reaction validated and energetically alive. The way out of the realm of The Devil lies in our complete honesty as we evaluate our self. If The Devil represents the power of negative and unproductive thoughts over us, then the honesty we must embrace is our ability to think for ourselves to determine what is in fact real and what has been conjured to make us emotionally reactive or unstable. Once we have discovered that, we suddenly notice nonsensical binds and utterances, and we can walk away freely. This is our moment of release. The 3 of Swords is the moment we have accepted the truth about a matter that has held us in place against our natural predisposition and pure essence. It is the warmth suddenly over spilling in our heart, the feeling of tears flowing uncontrollably, finally being let out. Most of all, it is the incredible clarity we feel, the gift of forgiveness we have given back to ourselves, and the true empowerment we embrace as we have consciously released that which has been oppressive in our lives. It is closure, it is the old story falling away with no relevance anymore, it is the acknowledgement of our pain in the best way possible: that it is no longer holding us down and defining how we operate in the world, that we can fully embrace the most beautiful parts of our selves and our surroundings. If you are interested in having a personal reading, please click here for more info! Well, I was waiting for your New Moon reading and am not disappointed, well done Daniel, definitely food for thought and reflection; thank you! !